Mount Pleasant Granary - Saturday 12th. April, 2014 – Housework! Slept in until nine and then had a leisurely breakfast before starting work on the spare room in the Granary. I worked at it all day, stopping briefly for lunch, and then walked Mix along Bramble Avenue which is all green with Spring bursting out everywhere. 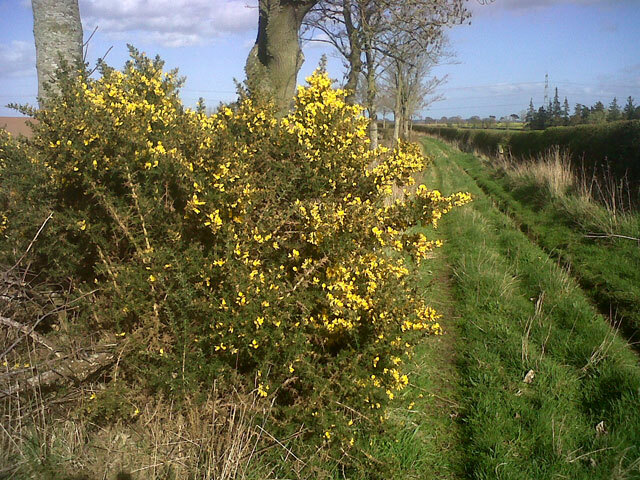 I loved the yellow gorse and birds are singing from every tree. Back home, I fed Mix and then we welcomed Mum, Olive and Digger for a meal at the Granary to celebrate Olive’s retirement. 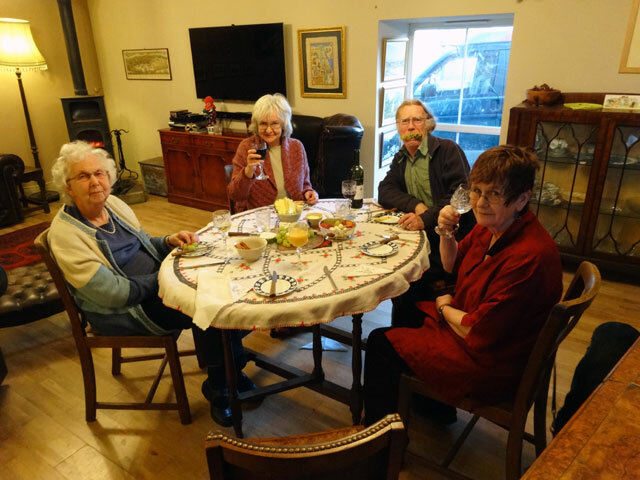 We dined well – antipasto Italiano, spaghetti Bolognese, and some cheese and fruit to round everything off (well, we did follow that with coffee and grappa) – and then we watched the start of a DVD series which had been given to Olive by Jeff. It’s called The Killing and is in Danish with English subtitles. Already after just one episode, we are gripped. After watching the conclusion of the third day of the Augusta Masters Golf, I walked Mix and went to bed. A good day. 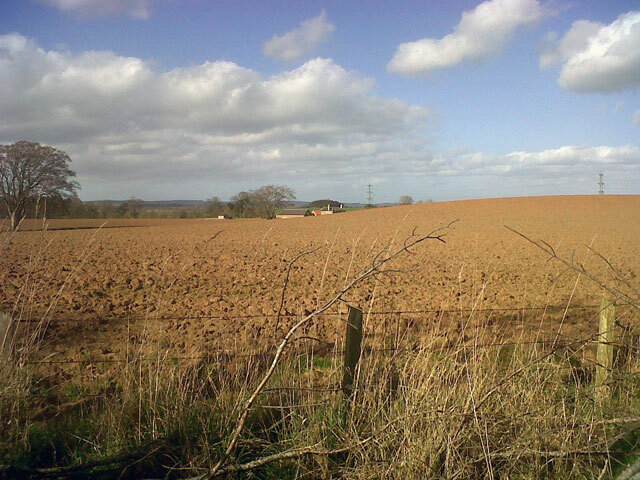 I am to go to Glasgow to a meeting of the Scottish Pilgrim Routes Forum a week on Thursday. I asked Olive (who is an expert at these matters) to get me a cheap train ticket because a standard return from Berwick to Glasgow would cost me £70. She has got me a ticket to Glasgow for £5 and a return (during the rush hour) for £9 – but the £9 journey is first class! Not bad. Less good was the service I received from DPD who deliver items for Amazon. They sent me a text to say that they would deliver a book between one and two pm. We waited but the delivery didn’t happen. Knowing the delivery was due I had Mum on stand-by looking out for the delivery but the time passed and eventually I got an email to say that they had tried to deliver the parcel and as no one was here they had left a card to say it couldn’t be delivered. No such card had been left, and no one had come to the farm house. I can be sure of that because there were five of us here all afternoon, and with three lively dogs on the premises it is just not possible for someone to come and us not to know about it. A couple of weeks ago, I came out to see a driver from DPD leaving the parcel by the gate and when I asked if I should sign for it he said it’s not necessary. Why did it become necessary on this occasion? No, the driver just didn’t come and has pretended we weren’t at home.